The caterpillar does all the work, the butterfly gets all the publicity. How true that is! This quote was pinned on the wall at the Australian Butterfly Sanctuary when I visited. Soon transfixed by the colour and movement of the 1500 or so tropical butterflies in this wonderful attraction in the rainforest village of Kuranda, in tropical north Queensland, I felt a little bit for the poor old caterpillars. But of course, they are not missing out…they are simply transformed from their “worker” state to the much-admired state of being that is the butterfly. 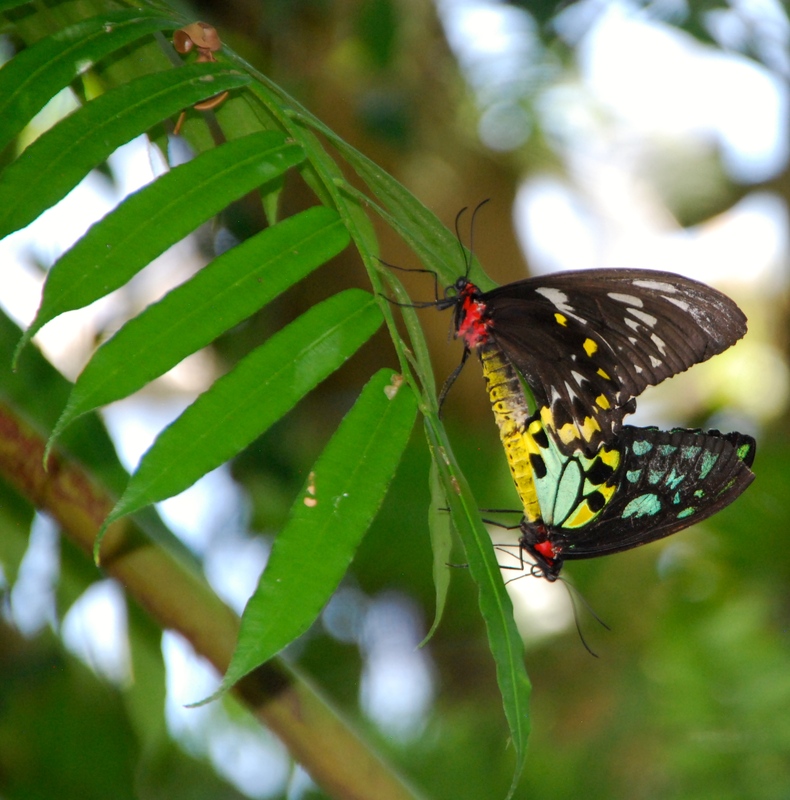 A female Cairns Birdwing, not so colourful as the male. And she was feeding on this flower upside down! The Australian Butterfly Sanctuary opened in 1987, and I hadn’t been back to visit since not long after that. I had forgotten what a fabulous place this is! 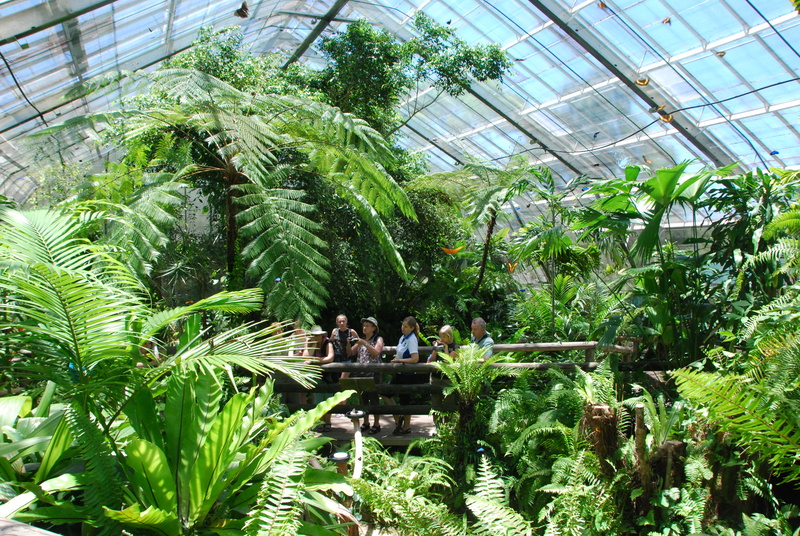 For a start, it is the largest butterfly flight aviary and exhibit in Australia and the butterflies that are bred here are all local rainforest species, including the electric blue Ulysses Butterfly, the Red Lacewing (pictured at the top of this post) and the fluorescent green and yellow Cairns Birdwing. 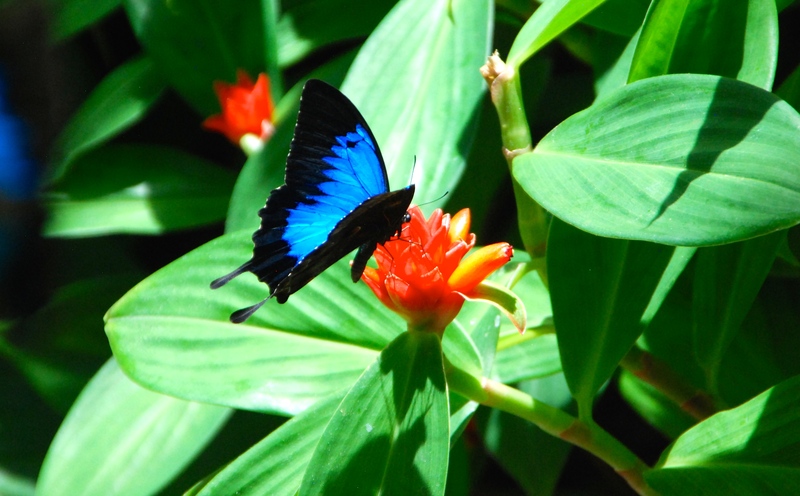 There are about 20,000 species of butterfly in the world, and 382 of them are Australian. The Ulysses Blue, a symbol of Kuranda. Not all the butterflies are vivid colours. 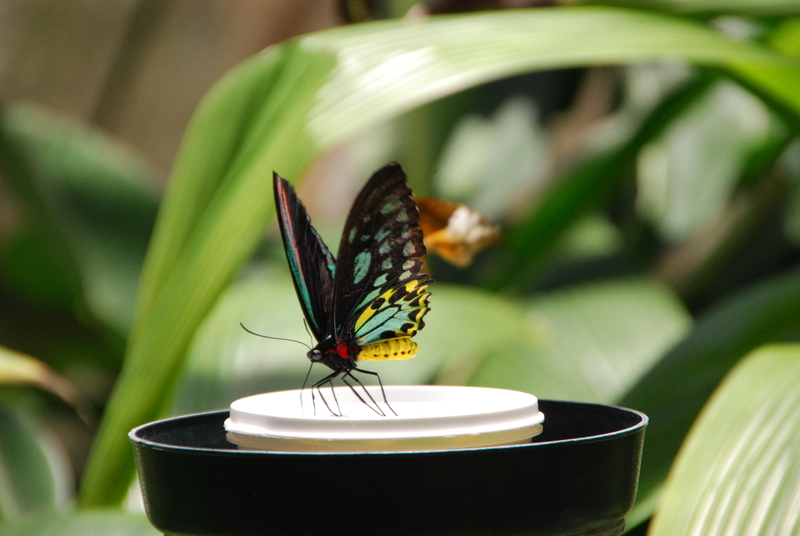 Guided tours through the aviary and the breeding laboratory are run, so you can learn all about a butterfly’s life cycle and behaviour, and why it is so advantageous for these creatures to transform from caterpillars to butterflies. About 30,000 caterpillars are bred, and about 24,000 pupae are released in the aviary each year. Butterfly nectar feeding stations dot the glasshouse, and we learn that butterflies need to drink nectar every 30 minutes or so. 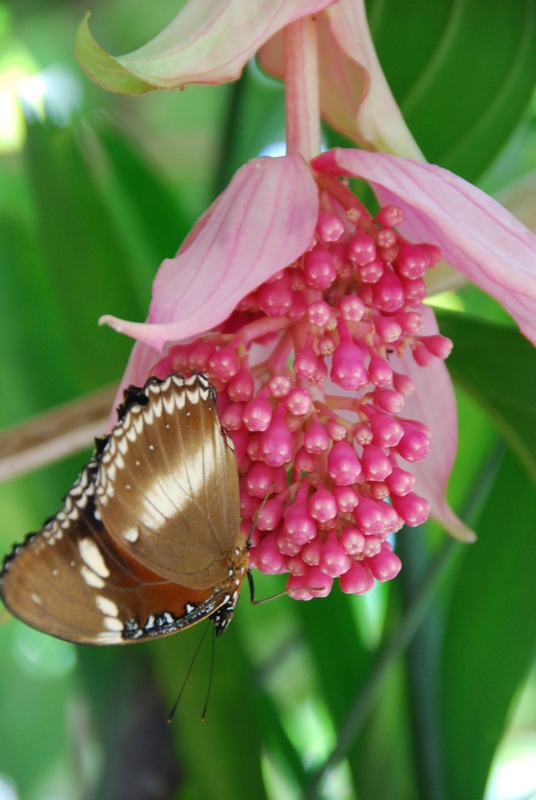 As a flower only replenishes its nectar at night, it would require about 36,000 flowers to bloom each day to feed the 1500 or so butterflies naturally. Cairns Birdwing butterfly on a nectar feeding station. But mostly, I was just content to spend a couple of hours watching and photographing these amazing creatures. And that’s no easy task – they just don’t sit still! Wearing the right colours (pink and orange are good) is said to attract the butterflies to land on you, but despite that, I didn’t seem to strike it lucky. Photographer Richard “Tommy” Campion, was luckier though – and I was able to capture this magic shot, which made both our days! A Ulysses Blue lands on Tommy’s face. Transformation. There’s no better example of it, I think, than butterflies. So this post was the obvious choice for me in completing this week’s challenge from Ailsa at Where’s My Backpack? Have a look at her site for more examples of transformation. 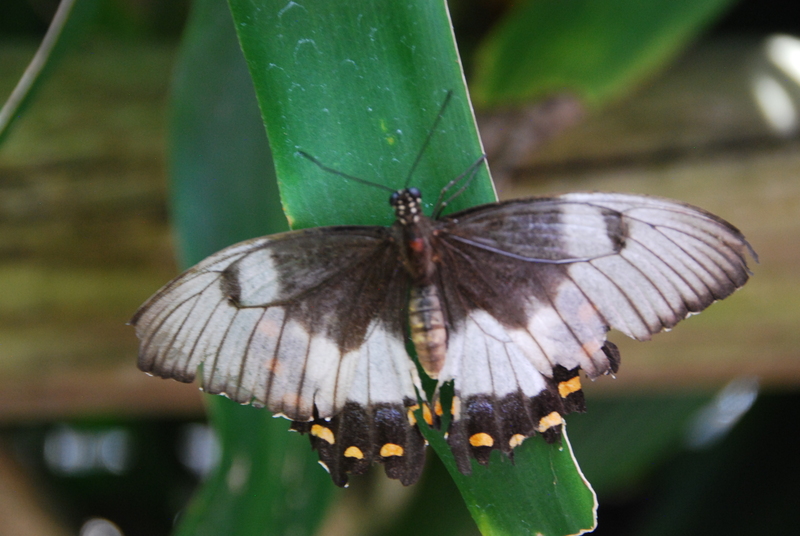 A Glass Half Full visited as a guest of the Australian Butterfly Sanctuary. A colourful story. Wonderful images. And it is a memorable place. I know that because I was there. 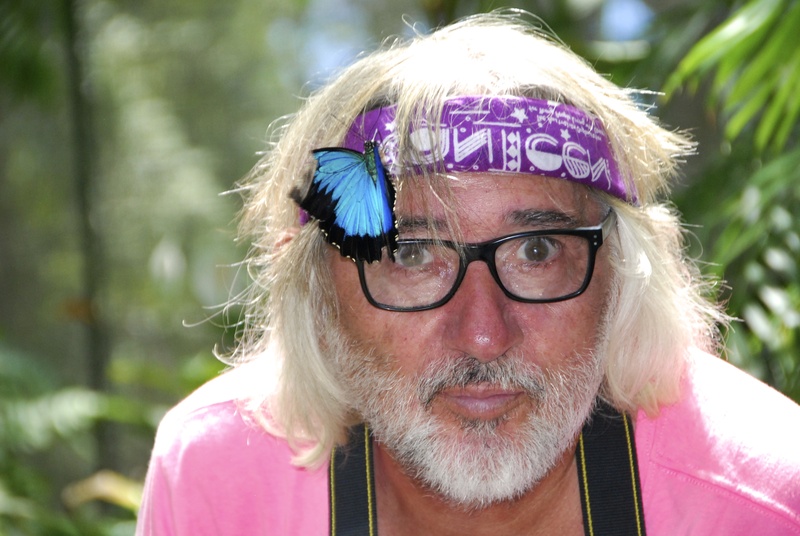 That’s me with the butterfly on my boofhead. Thank you! I was happy to get some good shots because they just won’t stay still! They should be “drugged” for the tourists. Shame on you, Tommy! Lucky I know you are only joking! Excellent shots – and like you say – transformation is what they stand for. I am relaxed just looking at your pics:). What a beautiful place! Such a pleasure yor butterfly-gallery! Oh you really should, if you can. It’s a wonderful place. Put it on the to-do list!